Philly-bred stand-up star Dom Irrera heads to Wildwood for a Labor Day weekend comedy blitz. Dom Irrera has been a fixture on the comedy circuit for decades, performing everywhere from local clubs to international festivals. Known for his sharp wit and straightforward humor, Irrera has also appeared in several films and TV shows, including a very memorable spot on Seinfeld. He’s a regular on the late-night talk shows, and has even shared screen time with Oprah Winfrey. Though he now lives in Los Angeles, the South Philadelphia native routinely makes it back east to perform in Atlantic City. Ahead of a three-night gig over Labor Day weekend at the Casba Comedy Club in Wildwood, Irrera spoke with us about coming home to celebrate the end of summer. 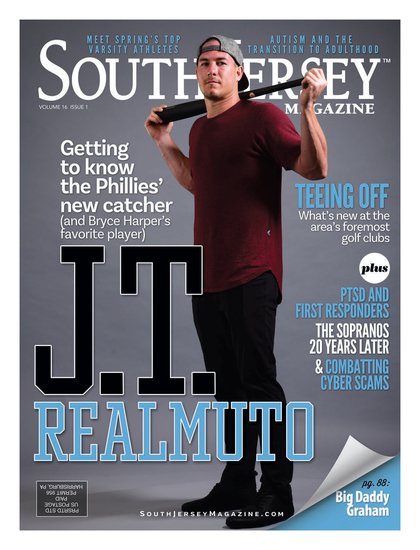 SOUTH JERSEY MAGAZINE: How are you doing? DOM IRRERA: Every year I get a little bit fatter, and hopefully a little funnier. I work almost every night [onstage]; it keeps me from drinking for an hour. SJM: In that case, are you looking forward to stepping onstage again in Wildwood at the Casba? SJM: How does a show at a place like the Casba compare to a gig in A.C.? DI: Both are cool in their own way, actually. One crowd dresses in jackets, the other in T-shirts. A.C. is a big theater and has that whole big showbiz feel. In the club, you can see people; you can bust their chops easier. It’s harder to bust chops when there are 1,200 people [in the room], and people can’t see who you are talking to. SJM: Growing up in Philly, you must have pretty fond memories of the Jersey Shore. DI: That was our place to go. It’s so ingrained in us. I was recently at Kahala Resort in Oahu with a friend, and we’re in the water at this beautiful resort. And we both say at the same time, “I can’t wait to get down the Shore.” The Shore is part of us. SJM: Do you remember the first time you felt comfortable onstage? DI: It happened gradually. I was always comfortable in front of the public. In first grade I was misbehaving, and this nun took me up in front of the eighth grade class and says, “You think you’re funny? Be funny in front of them.” And I was. It was a Catholic school, though, so I had to work clean. SJM: Has writing jokes and coming up with new material gotten easier over the years? DI: No! It’s hard because there’s so many different thoughts and comedians. [For instance], if you do topical stuff, you’re competing against talk shows with 10 different writers. SJM: I know you’ve been vocal in the past about other comedians ripping off some of your bits. How widespread is that level of thievery? DI: It happens consciously and subconsciously, but I don’t get into the comedy police thing. I don’t watch many comedians, other than my friends. SJM: As a comedian, are you able to leave your stage persona behind and live a normal life, or are people always expecting you to be “on”? DI: People see me [on the street], and they say, “What’s wrong with you?” If I was like I am onstage, I would get killed! SJM: Comedy is a tough business and stand-ups come and go. To what do you credit your longevity? DI: It’s probably my guardian angel watching my back. I’ve been lucky to transfer from generation to generation. If it wasn’t for college kids, I wouldn’t have a career. I would have people following me, but not enough to fill the clubs. Funny is funny, you don’t have to be the greatest Internet guy and be 30 years old to make [people] laugh. My thing is not about age; it’s about talent, ability and originality. I don’t care if you’re the youngest or the oldest. People come up to me and ask for advice, but you can only help people so much. So much of it is inside you.